Last Sunday, we were able to visit the Sgt. York State Park in Tennessee on our way back home from Georgia. Most people know the name Sgt. Alvin York or have seen the movie Sergeant York. ; if you have not, you are in for a surprise. Sgt. 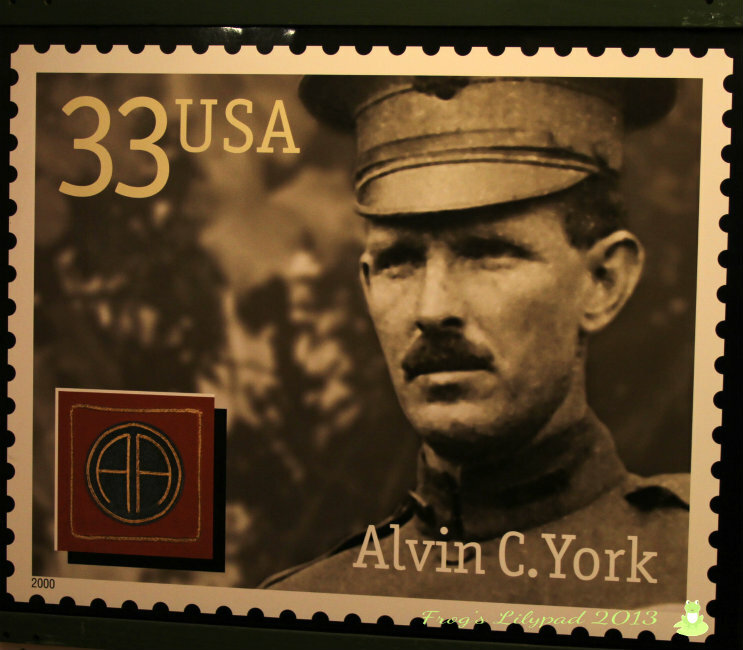 Alvin York was the most decorated soldier during World War I. He was born in the hills of Tennessee in the 1880's and he was a born again Christian and truly loved the Lord. When World War I began and he had to register for the draft and he was opposed to it. Sgt. York spent time in prayer regarding joining the Army at the "Yellow Doors"; cliffs overlooking the valley. 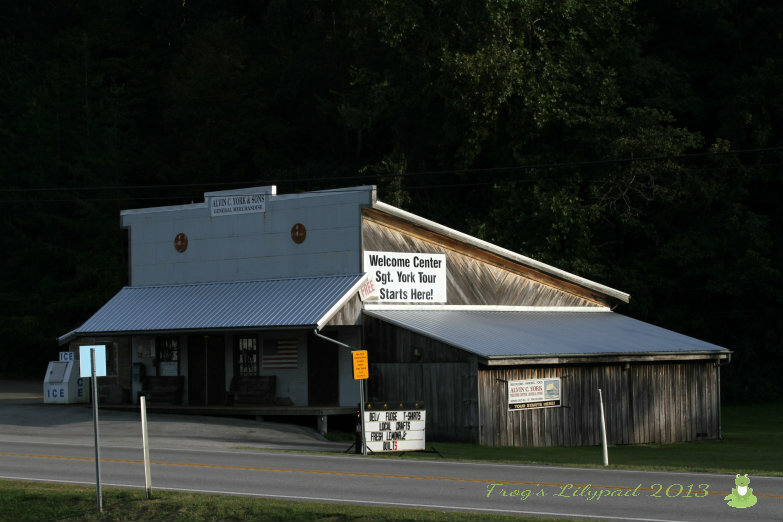 The starting point for the tour is the General Store that Alvin ran with his family after the war. Here you will be able to watch a short video about the life of Alvin York after the war and see memorabilia pertaining to his life. The store also carries souvenirs and beautiful handmade goods from the locals. A copy of the commemorative stamp that was produced in York's honor. This copy was a large piece and it had the paperwork telling about the stamp. "Yes, don't want to fight." He really struggled with the thought of having to go to war. Sitting outside the general store. The house and acreage was a gift to York after returning home from the war. A lot of people, (I was one of them) do not know the legacy that Alvin York left. He worked hard for the people in his state. He wanted a better education for the children in his area, so he started the York Institute in 1926. When the school started out, York helped fund much of the school's needs. He did not believe in "cashing in" on his fame so he turned down much money because of this. The 1941 movie Sergeant York, had his stamp of approval. Oh, yes, Alvin York also wet the site on his gun with his finger, just like in the movie. It was one of the questions my husband asked Andrew York (Alvin's son who was at the house giving tours the day we were there) said, "Absolutely, Dad always did that and he taught us to do it. It really works." The York home is beautiful! It is like stepping back in time because everything in the house from the carpet, to the curtains, to the wall paper is all original. Pictures are still hanging in the original places. There is a small but quite visible DO NOT TOUCH sign on the piano. Yes, I'm a rebel, so I hid the sign the a hymn book! Actually, Mr. York told me if I could play, to play it; I told him I do and I would be honored to play the piano. So, I did! For a piano being 102 years old, it played beautifully! According to Mr. York, I am one of the few who get the privilege of playing his mother's piano. ~ What an honor! This is Alvin's hospital bed he used after his stroke. It is known as the Ferris Wheel bed ~ quite modern for that time. The fireplace mantle in the living room. The family Bible was in a glass case. See the verse that is circled? This bonnet belonged to Sgt. York's mother, Mary and the picture is from the 1920's. Every bed had a beautiful chenille bedspread on it. I loved the yo-yo mat across the pillows. I would love to try my hand at frying chicken on the stove top and baking biscuits in this oven. I did not get a picture of the refrigerator, but it is the same green color. The dining room was warm and inviting. This is the spring the family got their water from before plumbing was put in the house. This is the church the York family attended and Alvin was saved here during a revival. Sgt. York is buried in the cemetery across the road from the church.